Benjamin Bomford was one of the sons of Benjamin and Mary (nee Smith) of Pitchill. He was born at Chapel Oak on 12th October, 1857, since Pitchill had been damaged by fire in that year. Benjamin married Gertrude Brewer Kendrick from Birmingham. Her mother (who was Granny Kendrick to Daisy and Norris Bomford), was a Goode before her marriage and she had lived at The Mynd, Offchurch, and was a wonderful gardener. Thomas Goode, brother to Granny Kendrick, lived at The Orchards, Salford Priors and is buried with three of his relatives, and Martha Kendrick in Salford Priors churchyard. Gertrude Kendrick’s sister, Margaret, married Ernest Martineau later to become Mayor of Birmingham. The Martineau family acted as solicitors for several generations of the Bomford family. 1. Norris Benjamin, born 1892, married Elsie Fisher from Evesham, and they lived at The Orchards. 2. Beatrice, born 1888, married William (Billy) Morton and lived at Dunnington Court, Chapel Oak and Heath Cottage. 3. Daisy, born 1894, married Pip Hughes and lives at Salford Lodge. Harvington Lodge is said to have been a school before Benjamin took up residence there. The house and farm also belonged to the Ecclesiastical Commissioners at various times. Benjamin farmed many acres which extended from the Lenches to New Inn Lane. He was reputed to have been a somewhat solitary man and would walk his farm alone of an evening. The house is a large family home with a garden to match and a ha-ha in the front and a pond. Although belonging to the Baptist Church at Dunnington which he helped to build and where he did “yeoman service”, Benjamin continued to show a great interest in the Church at Atch Lench where he used to worship as a boy. He was a member of the Trustees of Chapel property appointed on the 1st June, 1921. He was a founder member of Bomford and Evershed Ltd., together with his brother Raymond Bomford, Harry Evershed and William A. Fisher of Westfield, Greenhill, Evesham (whose daughter Elsie married Benjamin’s son, Norris). 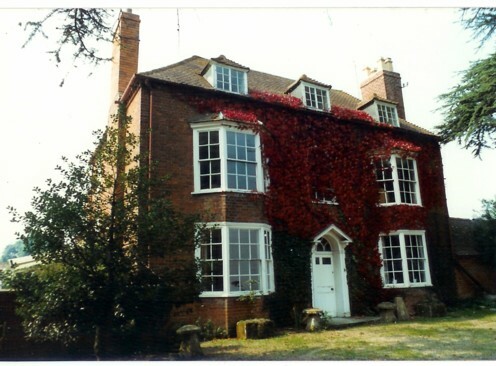 Harvington Lodge was an ideal family home and was protected from the Evesham to Alcester road (A435) by an orchard of Blenheim apple trees, now pulled up. There was a large swing suspended from high up in a fir tree which the children used and the pond had ducks on it and was good for sailing home made boats with duck feathers for sails. After the service at Atch Lench or Dunnington the family used to repair to the house for Sunday supper. At one time the family group farmed 5,000 to 6,000 acres and had land at Tylesford (later an aerodrome), Throckmorton, Pitchill, Bevington Hall, The Lenches, Harvington Lodge and Salford Lodge. The Land extended also through Rushford, New Inn Lane to The Orchards, and included the Worcester Meadows at Salford Priors. Uncle Ray managed the steam tackle and ploughing while Ben looked after the fruit and vegetables. In 1918 R. and B. Bomford split up to become Bomford Bros. of Pitchill and Benjamin Bomford and Co., who retained the fruit farms. “Benjamin Bomford lived all his married life at Harvington Lodge and he was one of the best known residents of the district and was highly respected. He was one of the largest fruit growers in the area and an agriculturist on an extensive scale. He took a lively interest in the affairs of Harvington village and was the first Chairman of the Parish Council at it’s formation. He was also a School Manager and a Trustee of parish charities. In his younger days he was a great lover of cricket and Captain of the Harvington team for several seasons. Benjamin and Gertrude were interested in everything to do with the village and all social occasions. They were members and regular attenders of Dunnington Church. They were buried together at Atch Lench, the Rev. J. Hughes officiating, assisted by the Rev. F. B. Greening (Manchester). The Chapel was packed to the doors. The Rev J. C. Hughes said that he never expected to meet in this world a finer example of a pure type of manhood that he had found in Mr. Ben Bomford’s seventy years of honest living, but his influence would remain. Harold Kendrick Bomford lived with his parents at Harvington Lodge and after their death he lived in the house and worked the farm. At one time he was in partnership with Pip Hughes of Salford Lodge as Bomford and Hughes, but the partnership was dissolved after some years. Nurse Bedford who had nursed Benjamin and Gertrude during their illness remained at Harvington Lodge as housekeeper to “Uncle Ken”. In later years he married Lilias Heath, whose father had at one time worked at Pitchill Works. Ken was very friendly with Norris and Elsie at The Orchards and used to visit the house frequently and go to parties there. But after Norris died he never went to the house again and was said to have been very upset when she married again not very long after Norris died. Elsie said she did this to keep the farm for her children and to be able to provide education for them. Ken was a good traditional Uncle and had a workshop in which he used to make all sorts of toys for his nephews. This workshop was next to the office on the right as you entered the back door. He was vary skilful at woodwork and made many models, swords, engines and propellers, ships etc., which were highly prized by the recipients. Ken was also a fine shot and a keen fisherman and acquired a large collection of guns of all calibres, as well as fishing rods. For many years Ken collected clocks and bought many at local sales, as Grant Righton and his father Ned Righton used to keep an eye open for any fine clocks at sales in the district. Ken would also carry out expert repairs on any clock requiring attention. At the hour the whole house would echo to the chimes of all types of long case and bracket clocks, in addition to the odd cuckoo clock. If any one was not keeping time Uncle Ken would get up, muttering, and put it right. Ken was a Director of Bomford and Evershed from 1930 to 1958. He underwent an operation in St. Marks Hospital, London, and came back to Harvington Lodge and was nursed faithfully by Lilias when his illness recurred. After his death Lilias lived on in the house until she died. The farm was left by Ken to Lilias and, at her death, the estate passed to her two brothers, Frank and David Heath. The clocks were put up for auction and this fine collection realized some £60,000. Thus one of the main Bomford family homes and farms passed out of the family control when it was sold at auction for some £345,000 to the Johnson family. The Johnsons also hold Morton Wood.